Which metro area offers the best bang for the buck? The Tax Foundation reveals in which cities residents have the most buying power. How much is $100 really worth? About $81 if you’re in Honolulu and about $126 if you’re in Danville, Ill. 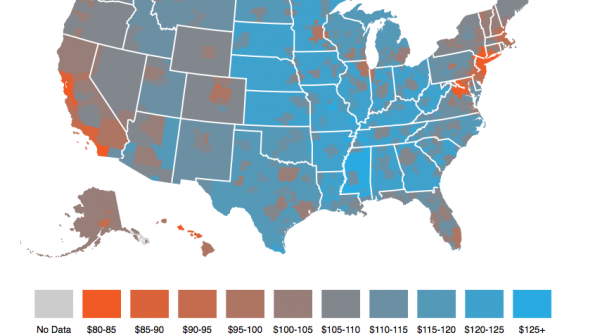 This value fluctuates between those two figures depending on urban area, according to the Tax Foundation, which recently released a map demonstrating the relative value of $100 across more than 380 metropolitan areas. The MSAs where $100 will by you the least, following Honolulu, are New York-Newark-Jersey City, N.Y./N.J., San Jose-Sunnyvale-Santa Clara, Calif., Bridgeport-Stamford-Norwalk, Conn., and San Francisco-Oakland-Hayward, Calif. But these metros are the exception rather than the rule. According to The Washington Post, in about 85 percent of metro areas, the purchasing power of $100 is greater than its face value. The implications of this data are far-reaching. The Washington Post reports it can influence migration patterns, tax decisions and social welfare rates set by policymakers. Commerce Secretary Penny Pritzker agrees. “For the first time, Americans looking to move or take a job anywhere in the country can compare inflation-adjusted incomes across states and metropolitan areas to better understand how their personal income may be affected by a job change or move,” she said in a statement. For more information, check out the interactive map below.